We have awesome neighbors. They are not only friendly, kind, generous and are practically like grandparents to Sarah, but they know our property inside and out. Which is wonderful, since we’re still bumbling around regarding all things farm. Diane’s parents used to own our property (they passed away a few years ago) and they farmed it: mostly apples, corn and cattle. So, when we started to pick apples for more cider on Saturday, they came out to help and showed us how to shake the apples down off the trees, which is much more efficient. And, wow, did we get apples! 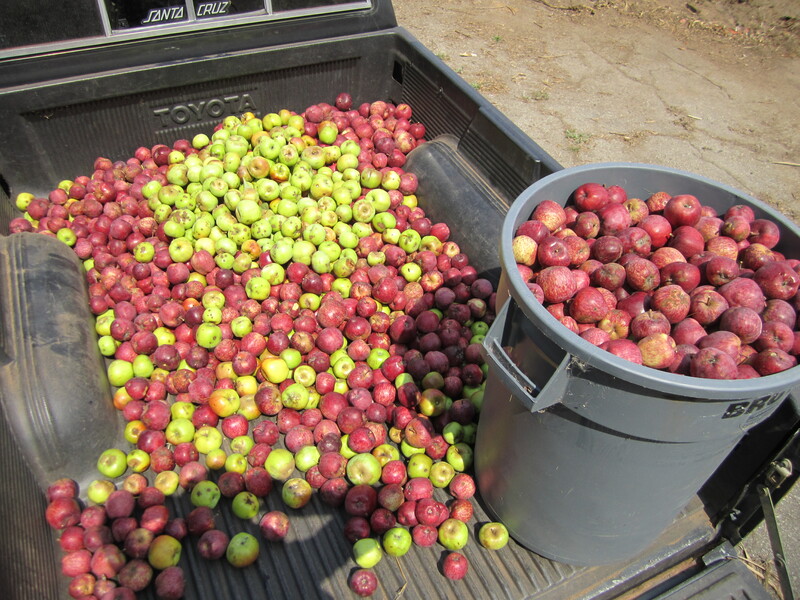 This truckload was from mostly emptying four trees, and a few apples from various other trees. So, maybe five trees worth, added together. We have 35 trees. Just sayin’. On Sunday, we pressed 8 gallons of cider and we still have two FULL trash barrels worth of apples. Jason did all the hard work of hand-cranking the press, and Sarah and I ladled the cider into gallon containers while fighting off the yellow jackets. We have no more cider containers, so we’ll have to buy cheap gallons of water and empty them. The two barrels of apples might make around 15 more gallons of cider. Time to plug in the chest freezer! The leftover smashed apples from pressing those 8 gallons filled up our compost bin (layered with leaves, of course). We have one more empty bin, but after that we’ll have to start a big compost pile down the hill. 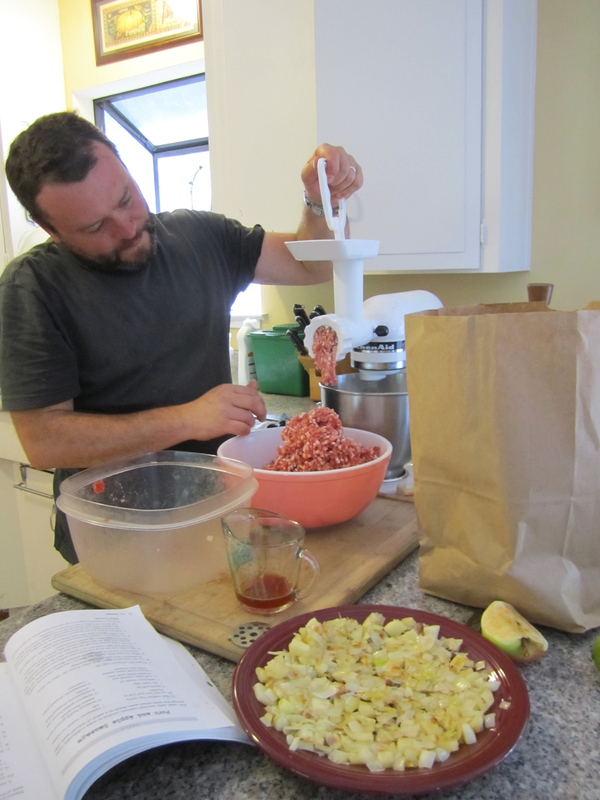 I envision a farm-sized compost pile that we’ll turn using the bucket on the tractor – and this apple smash stuff will be perfect to start it up. 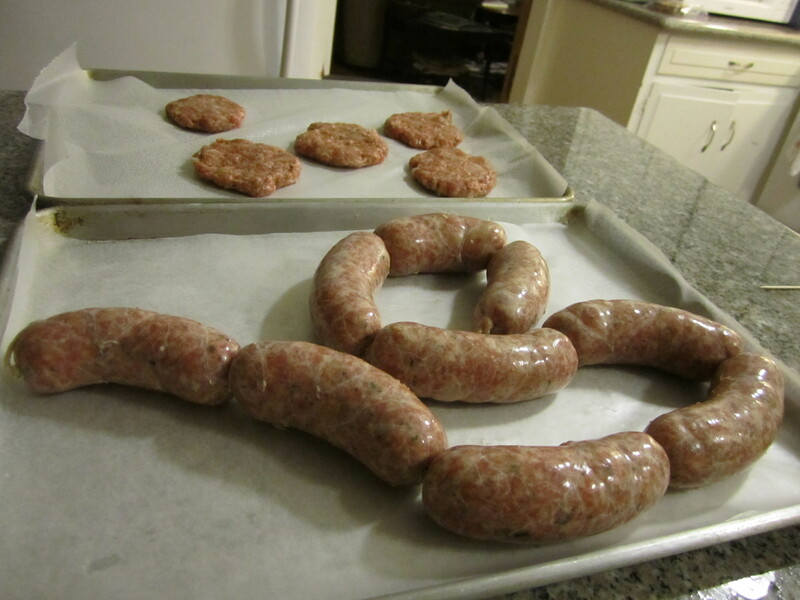 We ate some for dinner on Monday and decided they’re so sweet we’ll use them as breakfast sausage from now on. Yum! I was protecting myself from the poison oak as much as from the poison that I was spraying. I think it worked well in that regard, but I probably started to get heat stroke by the end. I stopped when I started to feel nauseated, and after I took off the jumpsuit I found I’d sweated through all my clothes – totally soaked. And I weighed two pounds less. Needless to say, I drank a lot of water afterwards! 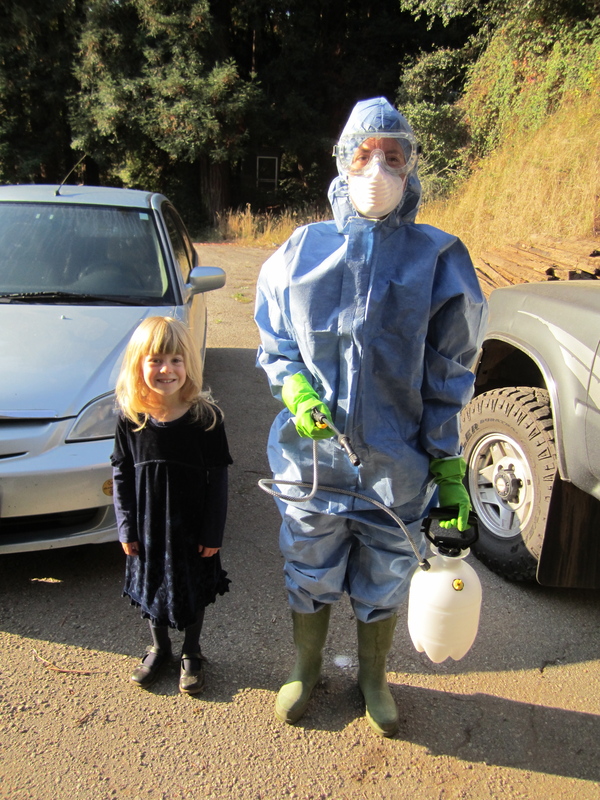 Luckily, that was all the important poison oak spraying, and the rest can wait until cooler weather. What is also lucky is that the poison oak is growing where we don’t plan on growing any crops – it’s mostly under redwoods and live oak trees. Our future vegetable garden area is completely free of the stuff. And certain areas, like the back forest and the upper pasture, are infrequently visited so I think we’ll wait until we have goats that can eat the poison oak up there. Ah, my theoretical future goats… For now, I’ll be happy when we can finally order our chicks. The coop is done, but the HUGE chicken fence is still in process – but that’s a subject for another blog. Meanwhile, I owe our wonderful neighbors a gallon or two of cider for all their help with the apple tree shaking. And next time they offer to help, I’d better be ready for a whole truckload of apples! go on girl! i understand why you had to use poison and u look so cute in that suit! ha! yo, happy birthday. 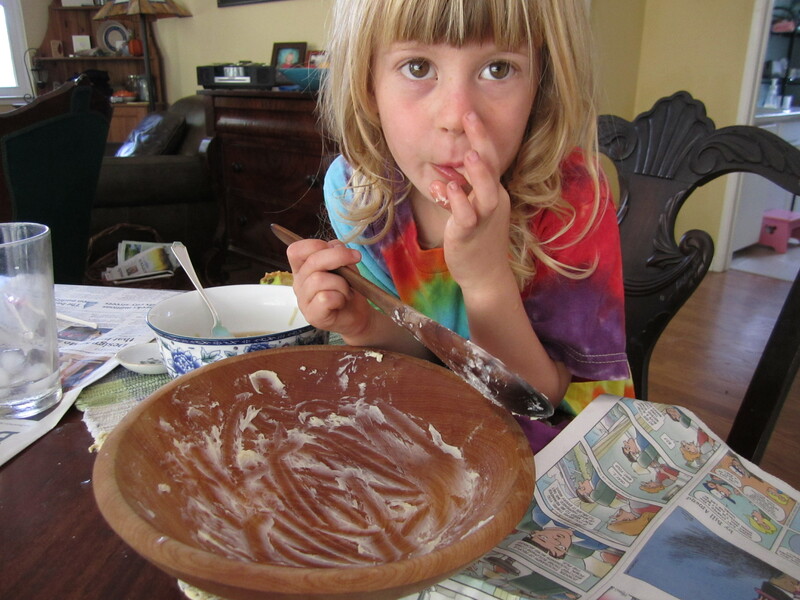 i want some buttah! I love this, sweetie! Keep it up! Love you ALL!